Our 27th Annual General Meeting will be held this coming Sunday. Order of Business: Establish a quorum, Approve Agenda, Minutes of the last AGM, Treasurer's report, President's report, Election of Officers, Discussion. and a leading advocate for heritage. His topic will be "Keeping Heritage Buildings on Public Land". Sunday, October 7, 2018 from 11am- 2pm. Sarah Haxby and Vikki-MicheleFreckleton have stepped up and with their exciting, wonderful energy, they will be actively recruiting and working to keep this community tradition alive. We are grateful for their enthusiasm and care and hope many more people can support their efforts. Sarah has set up a site where people can sign up to volunteer - CHECK IT OUT! VROOM VROOM! Its time for back to school cleaning, and we have a vacuum for you! Looking for a unique reclamation project? We have something special for you! We have some excellent old school chairs that could be hung up on a coat rack and used as shelf space! Come by Davie's Heritage Orchard (behind the Tuscany) and let these chairs help you turn your plain wall space into something truly useful and unique! These chairs are FREE FOR THE TAKING, and FIRST COME FIRST SERVE. Our hours are 9:30 - 5:00 Thursday - Monday. ONLY 3 LEFT! Raw Material for a Neat Project: Upside Down Stool Hamper! A Sturdy Functional Desk, with a Metal Frame! Last year a volunteer cut about 30 cedar rounds and this year half got painted. We laid them out on the checkerboard in the middle of Davies Orchard and it looked like someone had played a game of checkers the first night they were there. Two days later and they are all gone - not tossed over the bank, not under the cottage. There are a few chips of bark with paint but nothing else. If you have them or if you see them please return them . Cast iron tubs and sinks seem a bit difficult to move. Assuming you don't have a retro reno in mind, how about a hot tub in the back corner (you can build a fire under these brutes); park it in a paddock & fill it for your horse; have it near a hose & put your dog into it when it needs a rinse; cut it in 1/2 and make 2 chairs! and use a sink for a matching junior model. Save them from the landfill! Absurdly foolishly we had plans to fix up and, how ridiculous, even infill some of the missing cottages, so, years ago when cottages around the lagoon were demolished we carefully kept and stored old tubs, sinks, windows and doors. That was then, this is now, storage is at a premium and there is no hope of expanding or decorating so we are looking for good homes for some Bowen Heritage artifacts. And if you need ideas, we've been saving those up too! Please ask if you want any. Have you ever wanted to dig deep into heritage issues? May, 2018. We have received funding from both Young Canada Works and Canada Summer Jobs for 2 positions as tour guides. The funding provides minimum wage and we top up the salary to $14 -16 an hour. Positions are available from June 5 to August 27, 2018. The requirement from both sources is that you are planning to return to school in the fall. We are looking for people who are pleasant to work with, willing to work weekends and statutory holidays (when we have the most visitors), able to show some enthusiasm for the heritage of Bowen Island and do not require large amounts of supervision. EASY! Please apply today to bowenheritage@gmail.com. So the first (and possibly most confusing?) part of World Heritage Day is that that actually isn’t it’s formal name. What is popularly known as World Heritage Day is actually called The International Day for Monument and Sites and was established in 1982 by the International Council for Monuments and Sites, or ICOMOS. This organization was established on the principles set forth in the Venice Charter, otherwise known as the 1964 International Charter on the Conservation and Restoration of Monuments and Sites. The organization was founded after a need was identified to protect these valued locations, and it saw the coming together of experts from hundreds of related fields. These include architects, engineers, geographers, civil engineers, and artists and archaeologists. Each year they work to help ensure that some of the world’s most beautiful sites and important cultural monuments remain preserved for future generations. Since it’s inception it has grown to include almost 10,000 members in over 150 countries all over the world. Of these 10,000 members over 400 are members from institutions, national committees, and international scientific committees, all working together to save important sites and identify new ones that need to be added to the watch list. Perhaps the most important way to celebrate World Heritage Day is to search out those locations near you that count as World Heritage Sites, and perhaps pay them a visit. Before doing so research the site and find out what steps are needed to protect it, and respect them during your visit. If you’re feeling more proactive, then perhaps consider submitting a site that you feel is worthy of being protected for it’s cultural importance to ICOMOS. Don’t let an important site disappear from the world, do your part on World Heritage Day to raise awareness and preserve it for future generations. FREE mason bee houses, demonstrations, information, unveiling of new mason bee "condo wall". EVERYONE WELCOME. March 8, 2018. Many of you may know Michael Epp as a talented painter with many of his mini canvasses proving very popular at the Arts Council Mini Galas. In addition to that significant talent, he is by training an architect and has been working on learning the skills of programming for 3D printers. This is his first project and what a stunning tiny replica it is. Barely a 4" diameter base, there are minuscule details that make for a wonderful record of one of our beloved Davies Orchard cottages. Congratulations Michael. If anyone would like one, they are not inexpensive but more can be made. February 28, 2018. Community School Coordinator Sarah Haxby asked for student volunteers to curate a display about heritage to celebrate BC's Heritage Week theme of "Heritage that Stands the Test of Time". Ten students from Bowen Island Community School came forward. Unfortunately, flu season interfered with the final numbers but all 10 visited the Bowen Island Museum & Archives' Higgins Cottage and Bowen Heritage's Davies Orchard Cottage and chose topics to collect photographs and artifacts to illustrate their write-ups. Their displays can be seen in the foyer of BICS and are well worth a look. For example, one highlight is a detailed map of what is now Tunstall Bay but once was a large settlement (including a small gauge railway connecting Tunstall & Bowen bays) surrounding an explosive factory. Photo credit: Bowen Island Museum & Archives, as published in The Undercurrent, Feb.26, 2018. Metro staff presented their final report to the Parks Committee on November 8th. Hans Behm mentioned this petition but during the very short 5 minute opportunity to speak, he did not have enough time to present the petition, other than to mention that there were over 500 signatures up 'til then. The regional park staff recommended and it was accepted by the park committee that 4 cottages be demolished. They have removed the word "plinth" but little else has changed and they do not appear to have listened to our concerns. Your support for our efforts is very important. Please sign this petition - available for download here or fill in a copy at the Irly Building Centre or the Ruddy Potato, or mail it to PO Box 78, Bowen Is, V0N 1G0. We will pick up signed copies at both locations. Hans Behm will attend and make further submissions to the full Metro Board on November 24th in Burnaby. If you are interested and can attend and support his efforts that would be appreciated. Apple peeling and slicing - now until Saturday; Pie-baking - Saturday, October 7th from 10am to 3pm @ BICS kitchen - join us for 1/2 hour or more, bring an apron and a sense of humour; Pie sales - at the event, Sunday October 8th from 11am to 2 pm - again - 1/2 an hour or all 3; Chess mentor - teach the game and keep the pieces in one place; Cupcake Walk - help set up the numbered disks around the statue or bake 1/2 dozen apple spice cupcakes; Mason bee house contractors - with shingles, tubes, nails, hammers =stuff to make more houses for our bees. $100 CASH PRIZE. 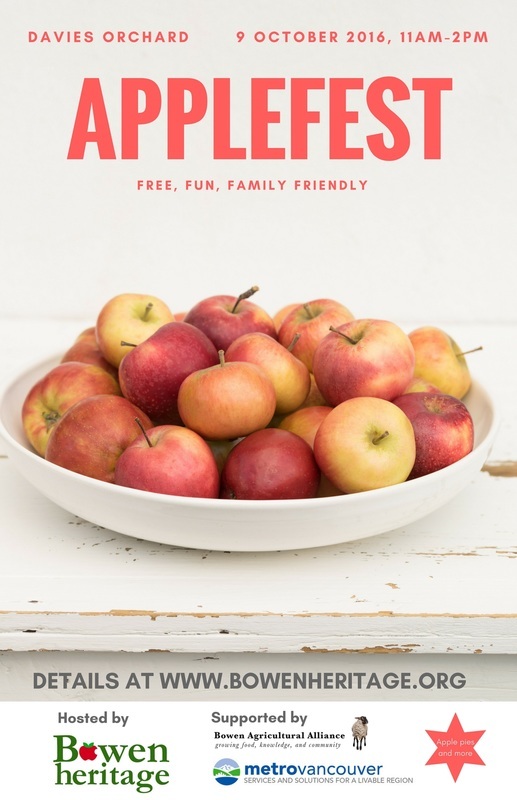 Create your favourite recipe, bring it to Applefest in Davies Orchard before 1:00 pm, October 8, 2017 and let our three Judges [Norma Dallas, Ian Thompson and Constable Arreaga] decide if the taste, texture and overall appearance are ... THE BEST! In July and August, Chloe Jackson and Gillian Richards welcomed over 450 visitors into our museum. With 3 sources of grants [Young Canada Works, Service Canada Summer Works and a Bowen Island Municipality community grant] we were open 6 days a week. One benefit of that is the ability to share these gorgeous photos taken by a visitor, Amy Tsang. Soon we are back to off season hours and tours by request. Email bowenheritage@gmail.com. It was a beautiful day, full of baseball and tourists, and we managed to attract a quorum and complete the formal requirements to maintain our registration as a Society in BC. Following a short business meeting, Leo McGrady,QC, regaled us with stories and pictures of famous and infamous protests and demonstrations he has studied. We had thought that some advice about "Peaceful Demonstrations" would be appropriate - not that anyone would aspire to a G-20 scenario - but we did learn that introducing humour is a key element for success. Leo's material is available free on his website: www.mcgradylaw.ca. 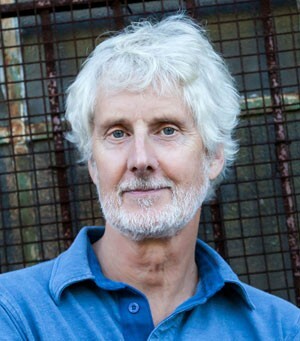 Please join us for our 26th AGM and hear Leo McGrady, Q.C., speak about the law concerning non-violent protests and civil disobedience. A Bowen Island resident himself, Leo is known to many of you as an expert on this topic, with publications and international presentations to his credit. It is sure to be an engaging and interesting discussion. Bowenians care about both heritage preservation and nature, and have shown recently how keen we are to protect our unique island home. Come get informed! All are welcome to attend. We look forward to seeing you all for this enjoyable afternoon! The Union Steamship Cottages are an important part of the heritage of Canada's West Coast and a reminder of the vitality of the island during the steamship days. Many of the remaining cottages are in serious disrepair. We are working to change that. More than 100 Bowen Islanders and friends now belong to Bowen Heritage. Please join us. For donations of $20 and above, please join us through the Canada Helps website. You will receive a tax-deductible donation receipt directly from Canada Helps. Download and print a membership form. Send it with payment to Bowen Heritage, PO Box 78, Bowen Island BC V0N 1G0. You will receive a payment receipt by mail from Bowen Heritage. Go to our online membership form. Submit the form and pay online using PayPal (includes credit card payment options). You will receive a payment receipt by email from PayPal. ​​If you have never or seldom visited the Museum in Davies Orchard you are invited to venture in - despite its current appearance, it really is a lovely spot and it is important that you find out more of what the current discussions are about. This past winter the Muni has installed a road sign (Cottage Lane) and a museum sign, so we are easier to find: down the lane between the Tuscany restaurant and the Seabreeze building in Snug Cove. 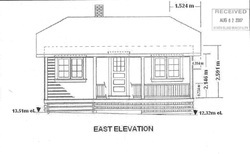 The first cottage on your right is the information/office cottage for Bowen Heritage with a room for used book sales (all proceeds to the new library addition), a public meeting space and a few things for sale (eg. 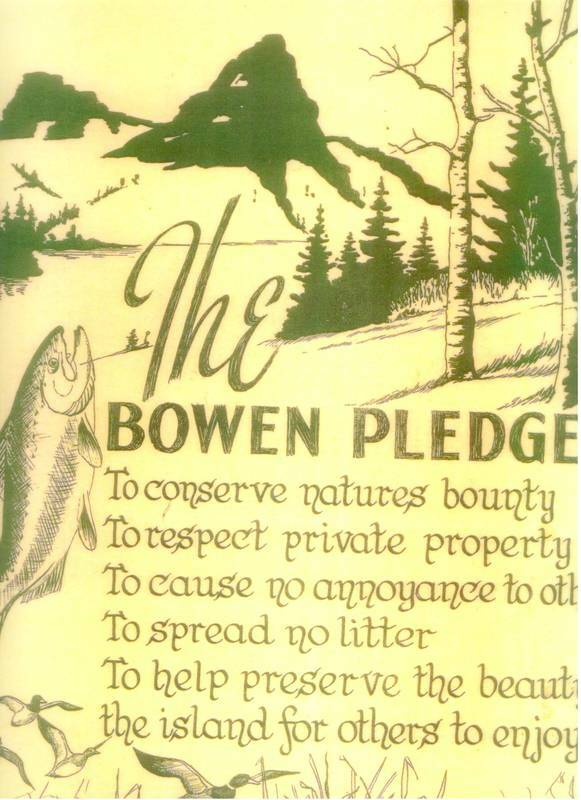 the Bowen Pledge poster). We got federal and municipal funding to hire a summer student/tour guide. Come and meet Chloe Jackson - a local student who will keep the office and museum open 5 days a week (Thursday to Monday) from 9-5. Our porch is a wonderful shady spot with chairs, tables, wifi, tea and not too many distractions. Our Museum was the first cottage to be fully restored to demonstrate that a neglected building can become dry, warm, comfortable - and beautiful, when decorated with the help of the Museum and Archives and several other donors to what it might have looked like during our resort heyday. Tours are FREE or by donation. There's also a demonstration garden, a mason bee colony, a bronze statue, some very interesting old and new fruit trees, and plenty of room for a blanket for a picnic or a nap. We encourage people to pause and dream of a public, well-used and well-loved collection of buildings as shelter during our long rainy season. If you don’t like the look of the place now, we couldn’t agree more! The legions of volunteers on Bowen (and we would encourage you to join in, as it is usually a lot of fun) have patiently waited more than 26 years for Metro to come up with a plan. We have been surprised that their only two options have such large scale demolition. Instead, we want Metro's support and participation to find more ways to fund, manage and publicly use these existing structures. Ideas: a child-centred classroom and nature centre. An off-season artist in residence programme. More tourist accommodation during the summer. And more!. You are invited to come and see and chat. ​Use our free Bowen Island Heritage Walking Tour (PDF format) to enjoy a hour or two exploring our island's history. Click on the booklet image to download. Produced in 2011, this video presents the case for intervention in the Davies Heritage Orchard. Some of the cottages are in significant disrepair. Video courtesy of Turtlebox Productions. This poster was found in a heritage house in King Edward Bay - it might have been Sheila & John Letson's home but Sheila thinks it must have been Joe Malkin's. It was originally created by the Rod & Gun Club. Bowen Heritage has reprinted them and has them for sale at the Information Cottage, #20 Orchard Lane, Davies Orchard. All proceeds go to Bowen Heritage. $10. Thursday - Monday, 9:30 AM to 5:00 PM. ​Bowen Heritage and Bowen Island Museum and Archives (bowenislandmuseum.ca) put on a display of our Island's history for Canada 150 celebrations. There were 8 story boards, Jack Little's history of the Union Steamship resort era, the gorgeous Reflections picture book and the Bowen Pledge poster all there for your viewing pleasure. If you missed it, please visit both museums this summer and learn more. We have published a map of all the heritage sites in Snug Cove and you can find it for free in #20 Cottage Lane. We welcome your visits. Metro is holding a Community Conversation to gauge the public's response to two concept proposals for redeveloping the Orchard area. Bowen Heritage is concerned that the proposals include demolishing either six or four of the ten remaining orchard cottages, primarily to improve views from the site. We believe Metro could do so much more by working with the community. 1. As many of the cottages as possible should be conserved. 2. The community, local and regional, can make great use of all the cottages. 3. We would like the opportunity to fundraise to save more cottages. 4. We don't believe the community has any interest in creating more views. Please try to make it to the event and help persuade Metro to expand the options under consideration. Following meetings of Bowen Heritage, R.C.M.P., Metro Vancouver Regional Parks and Bowen Island Municipality signs have been installed to both name the laneway so that it is easily recognized as a public space and not a private drive and indicate a public amenity, namely, Bowen Heritage's Union Steamship resort era cottage museum. Our Museum has been furnished with the help of several donors and the BI Museum & Archives to represent a family cottage in 1928, when they were first built, is decorated to reflect the seasons and is open on request. We happily give free tours for you and your visitors to learn and enjoy our unique and fascinating history. On December 6, 2016 Peter van Loan, Conservative critic for Canadian Heritage and National Historic Sites, introduced a Private Member’s Bill for the rehabilitation of historic buildings in Canada. Designed to support those who invest in our cultural heritage, this Bill will have the potential to encourage rehabilitation of properties in the Canadian Register of Historic Places. Heritage BC will be working closely with the National Trust, as we collaborate on a national campaign to build awareness for this important issue and work toward the successful adoption of this much-needed tax credit. Dress warmly and come to the Cove by 11am for the start of the 22nd annual Applefest in Davies Orchard. Why? Because it is fun, free, family-oriented, delicious, educational and supporting a charity working to save the cottages in the Orchard for future community uses. The rest of our message is more complicated but come to the event and we’ll be happy to bend your ear. The Bowen Agricultural Alliance [BAA] has organized a Farmers’ Market and we hopefully some craft marketers too. Meet a Regional Park interpreter and learn about pollinators, enjoy Bowen musicians and both the cup-cake-walk and sit down for tea with a slice of apple pie. There will be John & Josephine Riley’s fantastic apple display, plus apple tasting and sales and apple pies for sale as our major fundraiser. And for sure enter our pie baking contest to win $100. Our three Judges love that contest! Sarah Haxby organized a small army of students and teachers from BICS to pick apples with the permission of local orchardists with heritage trees, and volunteers have peeled and sliced enough fruit for 50 pies. The bake-a-thon at the Ruddy Kitchen is happening Saturday October 8th if you have any talent or interest in baking. Come join in - it’s fun! Immediately after Applefest, at 2pm, is the ribbon cutting celebration of the Garden Gateway Project. Bowen Heritage has been happy and proud to be involved. The Bowen Island Community Foundation provided a generous donation through us as a registered charity to Holly Graff and her proposal for a garden entrance to Bowen. Holly got the idea during a visioning workshop, also sponsored by the Bowen Foundation. Holly with Wynn Nielsen and James Tuer have orchestrated, with the municipality and a long list of additional funders and volunteers, the gorgeous results. And there’s more! Immediately after the ribbon cutting, at 3 pm, the Bowen Island Community Foundation is sponsoring a reception at Doc Morgan’s to celebrate the success of the Garden Gateway Project and launch their annual giving campaign. 3 great community events: all in one day and all in Snug Cove. Please join us to celebrate and give thanks for more good things happening on Bowen. Look for Our Tent at Bowfest! August 27, 2016. 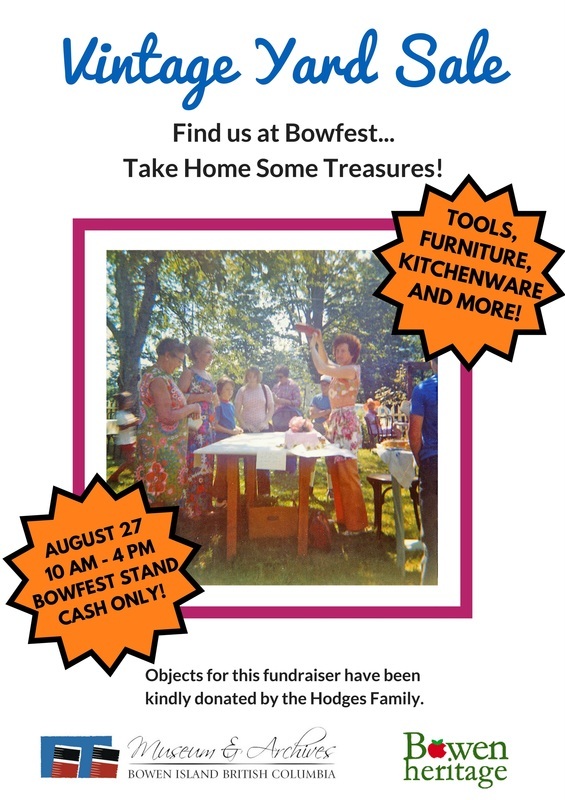 The Museum and Archives and Bowen Heritage are working together to prepare our very own Vintage Sale. Treasure-seekers rejoice at this fantastic collection of tools, kitchenware, furniture and more! All funds raised will be shared between the Museum & Archives and Bowen Heritage; we thank you for your support. The objects sold in our yard sale were donated by Becky West and Ross Hodges, who moved off Bowen Island in the summer of 2015. They had lived in a cottage that contained numerous items dating back to the 1940s, and felt that those objects should remain on Bowen. The Museum & Archives and Bowen Heritage initially selected items from the collection that were of particular interest, for display and archival purposes. Then, the Hodges donated the rest of the objects to be sold as a means of fundraising. We are very grateful for their generous donation, and hope these treasures can find good homes. Cash only please, and bring a bag to carry your goods! Local Vancouver artist and writer Michael Kluckner is well known for his unique style and talent, he has had numerous books of his work published throughout the years. Mr. Kluckner is not only an artist he is also heavily involved with local heritage organizations in the lower mainland and often speaks on the importance of heritage preservation. He has demonstrated his support for the community of Belcarra, as they struggle to maintain ownership of their beach-side cottages that are on Regional Park property. Click ﻿here ﻿to read more on Belcarra. Michael Kluckner recently visited Bowen Island to speak at the Bowen Island Museum and Archives AGM. Here he shared some watercolours from his own collection and shared a few of his own personal connections to Bowen Island. Click here to read about his trip to the Island. The current exhibition at the Bowen Island Arts Council Gallery in Artisan Square, and on display until July 17th, is hosted by the Bowen Island Museum and Archives. It features a wonderful cross-section of archival photographs, the work of local mixed-media artist Vanessa Hall-Patch, and “altered” archival photographs created by Ron Woodall. All the works incorporate Bowen’s early history with an emphasis on the Union Steamship resort days. Some of the archival photographs are “new” to viewers and all are a fascinating glimpse into our rich “glory” days. Ron Woodall’s altered images demonstrate a technique he has created with old and new photos, adding colour, character and spice. Good fun, and serious art, which is what we have come to expect and love. The Davies Orchard Cottages are the focus of the work of Ms. Hall-Patch. A few pieces, labeled “Kintsugi” cabins, are images of deteriorating cottages removed from their orchard backgrounds and transferred onto clean white backdrops, highlighting their current state of disrepair. The images then have small areas of gold added. “Kintsugi” is a Japanese word for the art of repairing treasured broken pottery with gold. The use of the precious metal is meant to emphasize the use and wear of a beloved object by highlighting its cracks. Kintsugi highlights the flaws rather than treating a crack as something to hide or disguise, or the flaw resulting in disposal. The comparison between this pottery repair method and the orchard cottages is an incredible perspective on these rather pathetic looking buildings. It offers the idea that despite their slow deterioration there is the possibility of a new beauty to be found within their years of use and love. Visit the Gallery at Artisan Square now and often to enjoy this great exhibit. And encourage and praise the Museum and Archives for their continuing efforts. Is your garden being invaded by pests like deer, crows, slugs -- even a rabbit or dog or cat? You need a SCARECROW to protect it! Build your own personal scarecrow to repel those nasty pests, amuse your friends and neighbours, and maybe win the second annual Bowen Heritage Scarecrow Contest. "How do I make a scarecrow?" you might ask. Well… let’s assume it is for crows ... Start to create your garden guardian with something strong that can be jammed into a hole - like an old rake or broom. Attach a cross bar, making sure it’s secure. Paint a face on the rake or a paper bag and attach that as the head. Gather up some old clothes, hats, shorts, bells, whistles, and flashy things to create a fetching ensemble guaranteed to freak a bird. The only requirement for your garden guardian is that it must be created and designed with recycled materials, so be creative! When you are finished, carry it safely down to the Davies Heritage Orchard by noon on Saturday, June 18, 2016, in the Demonstration Garden located behind Cottage 20 (the info cottage) for a chance to win the title of Bowen Island’s Best Scarecrow. March 30, 2015 - Holly Graff has received a ﻿Community Service Award ﻿from the BC Society of Landscape Architects for her tireless volunteer work on the Garden Gateway project. Congratulations and thanks to Holly. Jan. 12, 2015 -- Good news! By resolution, the Bowen Island municipal council endorsed the Garden Gateway Project and will waive the cost for a development permit for the project, further directing staff to work closely with volunteers from the project in facilitating the project in a timely fashion. Dec. 2, 2014 -- Upon municipal approval to proceed, the Bowen Island Garden Gateway Initiative will receive $15,000 from the Bowen Island Community Foundation to help build a garden walkway with native plants and stone seating between the cenotaph and the washroom block at the ferry. The project, led by Holly Graff, Wynn Nielsen, and James Tuer, will bring together an innovative and collaborative mix of donated and discounted resources to help create a visually pleasing arrival and departure point at the ferry. Bowen Heritage is pleased to be a partner in this project. Thanks to our 2012 summer student, Mariah Fleetham, for her creative work producing Memories of Bowen Island. This 30-minute video will introduce you to life on Bowen Island in the early and mid-20th century through the recollections of Islanders, with selected photos from the Bowen Island Heritage Preservation Association Archives and from the Bowen Island Museum and Archives. A copy is also available from the Bowen Island Public Library. This clip features edited excerpts from Rails to Romance, a promotional film/travelogue produced for the Pacific Great Eastern Railway in 1945-47 by the BC Government Travel Bureau. The Union Steamship vessel Lady Alexandra leaves Vancouver harbour and stops at Bowen Island, a popular holiday destination. After the film pauses at Bowen to outline the resort and recreational facilities there, the steamer continues its trip to the PGE's southern terminus at Squamish. Passengers and freight are transferred from the Lady Alexandra to the waiting PGE train. Courtesy of the Royal BC Museum. Our community comes together every Remembrance Day at the cenotaph in Snug Cove. This short video shows a 1937 ferry trip to Bowen Island, a very well-attended parade complete with marching band, and the flag-raising ceremony for the cenotaph. By transit: Take the No. ﻿257 or 250 bus ﻿from Georgia Street in Vancouver to Horseshoe Bay and ﻿walk on the Queen of Capilano ﻿at the ferry terminal. Steps from the ferry dock, you'll find Davies Heritage Orchard and more. By car: Take Highway 1 to Horseshoe Bay. Parking on the island is limited, so you may wish to travel as a foot passenger. Take the "village" exit and park in the parkade immediately off the exit ramp, or in the BC Ferries lot near the terminal. Walk on the ferry. The ferry accommodates cars but often overloads in the summer. Tours: In the summer, Bowen Heritage offers free guided tours of the orchard and museum. We are open 9:30 a.m. to 5 p.m., Thursday to Sunday. Tours are available at anytime. The orchard is always open, but the engaging stories of how William and Florence Davies planted the trees and how John and Josephine recently rejuvenated the orchard are part of our special guided tours. Contact us at bowenheritage@gmail.com. 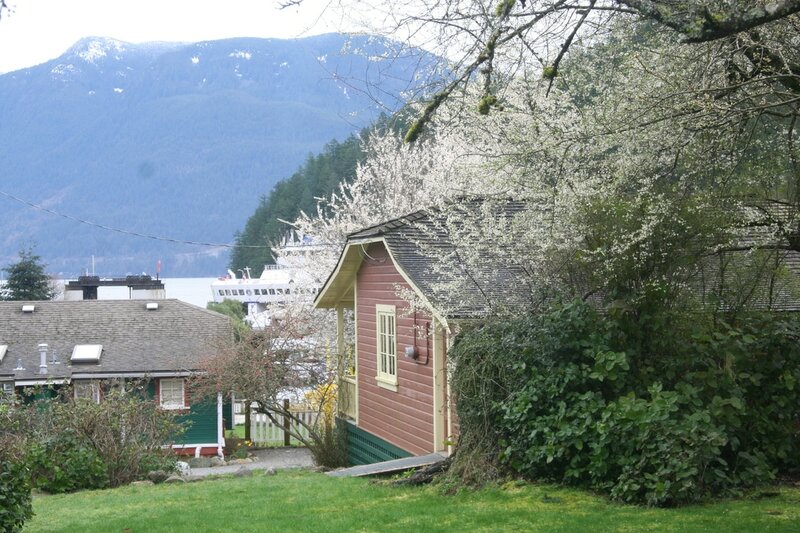 The Union SteamShip Marine Resort offers heritage-style accommodation in Snug Cove. For more information on the lodging available, visit the USSC website.